This pouch was made due to demand from some high speed friends that had need of both a shingle for 5.56X45 box magazines and double stack pistol magazines. 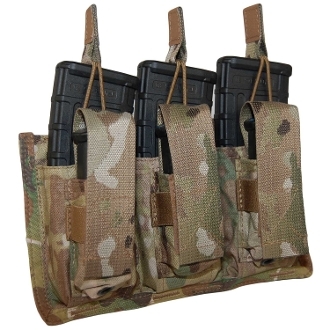 The main magazine pouch bodies fit a single M16/M4 magazine (PMags will fit) in each cell and the magazines are secured by a bungee retainer and pull tab with SureGrip material on the tab itself. The pistol magazine pouches were sized around a .40/9mm Glock magazine, but because of an elastic retainer around the body of the pistol magazine pocket, a wide variety of magazines will fit. The lids on the pistol magazine pockets are adjustable for length and can be removed completely if the shooter wishes to. To reduce weight, the pouch is constructed of 500 denier DuPont Cordura. The pouch weighs about 9 1/2 ounces empty, measures about 8 1/2 inches wide by six inches tall, and uses 6 channels and 6 rows of MOLLE space. Like all ATS-made gear, it's made in the USA and covered by our lifetime warranty against defects in materials and manufacturing.